How to Get the Nutrients You Need on a Vegan Diet - U-RAAW! The vegan diet has become more prevalent these past couple of years. Why is this? While some vegans choose to avoid animal products for ethical and environmental reasons, more and more are choosing eliminate animal products for health reasons. For others, following a vegan diet may prove detrimental to their health. Either way, meat and dairy provides many essential nutrients to our bodies. 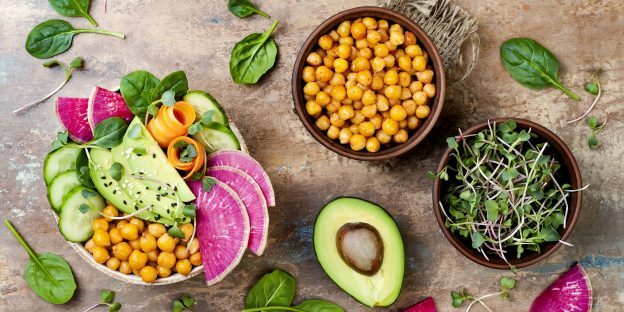 If you are choosing a vegan diet, it simply means that you will need to put more effort into planning it carefully, being sure to get sufficient amounts of every nutrient. Iron is an important component of hemoglobin, thereby helping carry oxygen throughout our bodies. When following a diet where you can’t eat meat, you can get adequate iron from foods like beans, tofu and wheat. Eating fruits and vegetables high in vitamin C can also help your iron levels, as vitamin C increases iron absorption! When you think of calcium, you probably think of dairy. However, soybean products and dark green vegetables have high amounts of calcium as well. Even some fruit juices are fortified with calcium. Calcium is the most abundant major mineral in the human body, so it is important to make sure you are getting enough from your diet! Unforunately, vitamin B12 is found mainly meat products. This means that vegans must eat their vitamin B12 in the form of nutritional yeast, or from foods fortified with this vitamin. Vitamin D is another vitamin vegans are at risk for being low in. This vitamin is important for helping your body absorb calcium. Not only can you get vitamin D from fortified foods, but also from sun exposure. To ensure sufficient vitamin D, you should try to get soak up some rays at least 3-4 times per week. Protein is crucial for so many parts of your body, from your muscles to your skin. Any vegan or vegetarian has probably had someone (frustratingly) comment on how it must be impossible to get enough protein without meat. While it is true that meat and eggs have high amounts of protein, there are plenty of other high protein foods that are plant based. Vegans can get protein from nuts, grains, legumes and soybean products. You would be surprised at how easy it is to get the 45-55 grams of protein recommended per day. If you are choosing a vegan diet, just be sure you are meeting the nutritional needs of your individual body. If you are low in a specific nutrient, taking a supplement could be a good option. With a little extra knowledge and awareness, veganism could be a diet that greatly benefits your individual health!